Best Books for GRE Mathematics. The New Revised GRE Quantitative Section is easy to crack, given the correct amount of preparation and practice with the right kind of material. While there are hundreds of books available for this niche topic, most of them are a complete waste of both your time and money. Selecting the best preparation material for you is as important as actually using it to study. Before deciding on the Books to Use Before you go out and purchase a GRE Quant preparation book, understanding the different parts of the GRE Quantitative section is a necessity. ALGEBRA which includes Linear Equations, Quadratic Equations, and Coordinate Geometry. ARITHMETIC which includes Decimals, Fractions, Percents, Ratios, Numbers and their properties. GEOMETRY which includes Lines, Angles, Triangles, Circles, Quadrilaterals, Polygons and 3D figures. DATA ANALYSIS which involves Probability, Statistics, Graphs, Tables, Charts and Distribution data. The best books to acr the GRE Quantitative are those who cover all these concepts, contain tips to ace them, also contain practice questions ranging from easy to challenging for each section of the GRE Mathematics. Since most books cannot offer all of the above together, the best results will require two to three books; one which explains each topic scientifically and elegantly, one which contains a large number of practice questions and mock test papers, lastly if you find yourself weak in a particular section, book which contains practice questions for that section alone. The PowerScore GRE Quantitative Reasoning Bible This is the best available book for preparing maths section of GRE General test. It has over 500 pages and costs around $20 (which is quite reasonable). book has more than 350 questions with detailed explanation. It covers all sections needed to prepare for GRE exam. You also get free online Flash cards/Formulas. Official GRE Quantitative Reasoning Practice Questions This is official book from ETS with 150 REAL TEST QUESTIONS with answers and explanations. Some topics are covered in the book that are important. Price is $20. KAPLAN GRE PLUS 2019 Over 1100 pages, has 6 practice tests, online content and mobile-friendly. BARRON'S GUIDE: This book looks into every minute detail of each concept and provides a wide range of practice problems for each and every section. While the number of practice questions is not sufficient, the methods provided to solve the questions will save you a lot of time when giving the test. 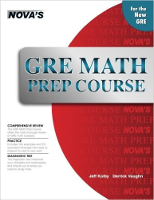 NOVA'S GRE GUIDE: This has been rated as the best book for GRE Quant Section by most test takers. It provides many shortcuts to understanding and remembering concepts through worked out examples. Practice problems are also provided in abundance. MANHATTAN GRE PREP BOOKS: These books render perfect practice as each book is specifically designed to cover each section in the GRE Quant. Since the difficulty level of the problems is quite high, if you can solve these problems easily within the time limit, the chances of a perfect 170 score are high. PRINCETON REVIEWS' CRACKING THE GRE MATHEMATICS AND McGraw-Hill's CONQUERING THE NEW GRE MATHS: Both of these books provide an in-depth analysis of every type of question that appears in the GRE with full practice sessions which focus on improving your problem-solving skills and time management. If you make the most of the Practice and Preparation material which you buy, work hard, and manage your time well, you will score high in the exam. Try to use free GRE quant tests and prep material on our website.